because they work better than competitors. Yet when competitors are required for certain jobs — such as Jedit for editing programs or Google Talk for online message logging — I use those as well. With that in mind, I have now modified Firefox to use Microsoft Windows Live Search instead of Google. The moment of truth came when I was searching for my article on Citi MasterCard’s reward cuts. Of the top five Windows Live searches, four bring you to my page. Further, the very top result is exactly the one I’m looking for. However, on google there are only four results, and while three will take you there, none are a direct page link. (I also found through my experiment that spammer sites are now using “tdaxp” as a junk keyword. Before I started this blog, the only pages that contained “tdaxp” were the raw output of some statistical program. So I guess that’s a move up in the world, heh). I’ve already noticed this with my evolutionary politics notes, with google typically taking you to the category main page while Windows Live Search brings visitors to the actual post. I began using google back in the google.stanford.edu era. From then to now, I have never had another primary search engine, or recommend that anyone else do so. 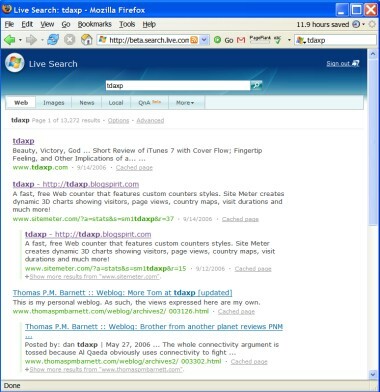 Now I can say this: I use Windows Live Search. You should, too. I have installed Stuart Marshall’s Windows Live Engine for Mozilla Firefox, and have changed Firefox’s default behavior by making Windows Live my default search engine (a now removed copy of Yahoo Messenger sneakily changed this behavior and refused to change it back). I will still use Google apps as they are useful — Google Talk, Goolge Scholar, and GMail especially — but Google Search is no longer the best in the business. Windows Live Search is. Additionally, in both Google and Live Search, my friend Mike’s blog “Spooky Action is the 2nd result. Let’s change that, and make Spooky Action #1! No, I haven’t flip-flopped on my greedy rant against Citi MasterCard. Rather, I have passed the CITI Course in The Protection of Human Research Subjects. The half-day, online course is designed to teach researchers to respect privacy and generally not hurt people. I need to take it to run human experiments as part of my final project, which attempts to determine a Suicide Punisher Type that is independent of politics, overall personality, etc. It is also possible that when groups or communities rather than individuals are the focus of a study, the group as a whole may be at risk of harm. For example, studies comparing the average IQ of “racial” groups or the prevalence of HIV-infected individuals in communities may stigmatize the community being studied. So there is “dangerous knowledge” that shouldn’t be studied, at least according to CITI’s insane interpretation of the federal statues, because the findings may be politically incorrect. I guess findings that liberals (and conservatives) believe what they do in part to genetics, that whites and indians may both have some neanderthal in them, and that men and women tend to work together differently, are also dangerous? I’m increasingly sympathetic to the pure sarcasm school of blogging. Chubby maroons.